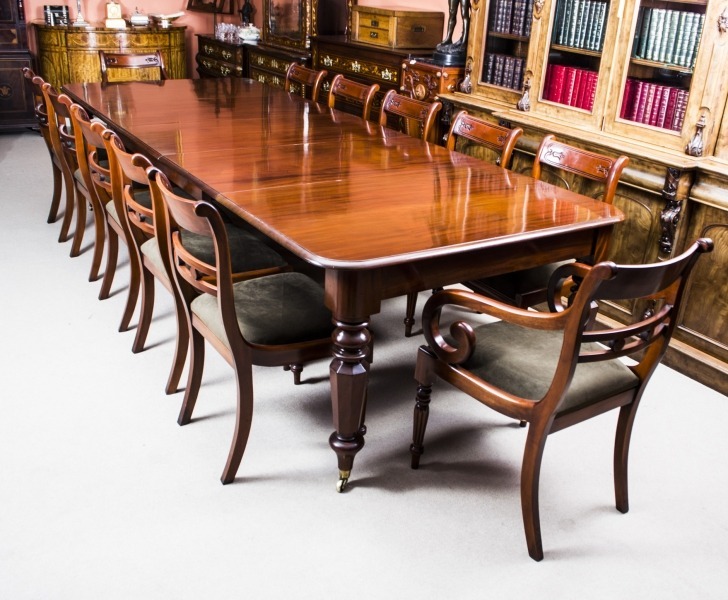 We recently found an admiring new owner for this magnificent antique dining set comprising a William IV mahogany dining table dating from around 1835 together with twelve Vintage Regency style dining chairs. This table was supplied with three original extension leaves enabling it to be extended from 146cm (4ft 9in) wide without any extensions up to 320cm (10ft 6in) with all three extension panels in place. This table will easily seat 12 people in comfort. A most attractive and versatile set, sure to be appreciated by all who see it. Also sold was this lovely Antique Victorian Mahogany 3 Piece Suite which dates from around 1890 and which is sure to add a touch of class to any room it is placed in. The suite comprises of a sofa, measuring 4ft 3in and two tub chairs and is upholstered in a terracotta coloured velvet. As you can see, it is not difficult to understand what attracted the new owner to this very striking desk. 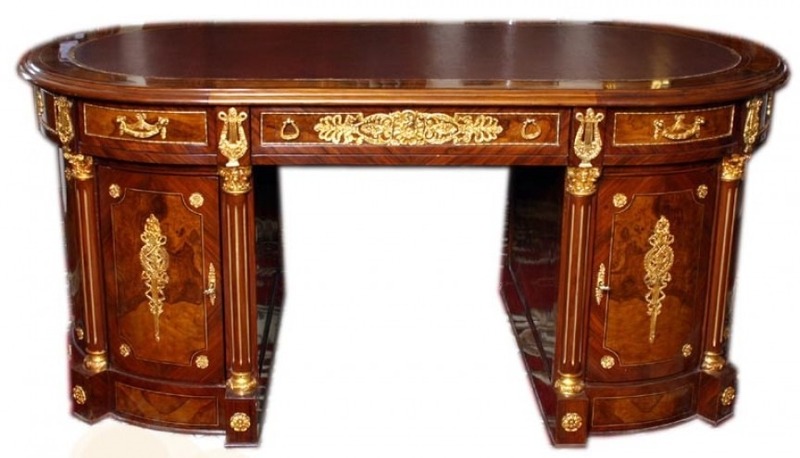 The sheer quality of the wood, combined with the stylish embellishments and fine workmanship all combine to make this a very desirable desk indeed. 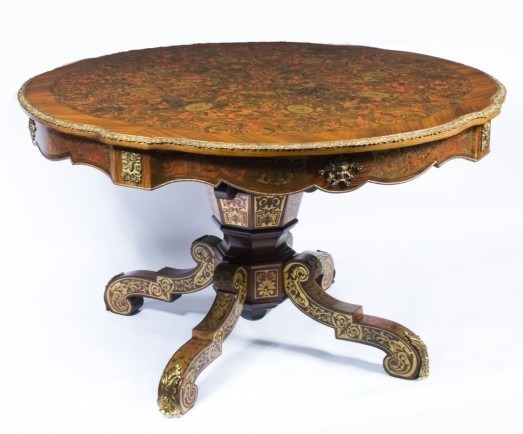 Next we look at a fine Vintage Walnut Floral Marquetry Cut Brass Boulle Centre Table that we acquired from a country house sale in Wales and which was originally supplied by Meuble Francais in London’s Mayfair. 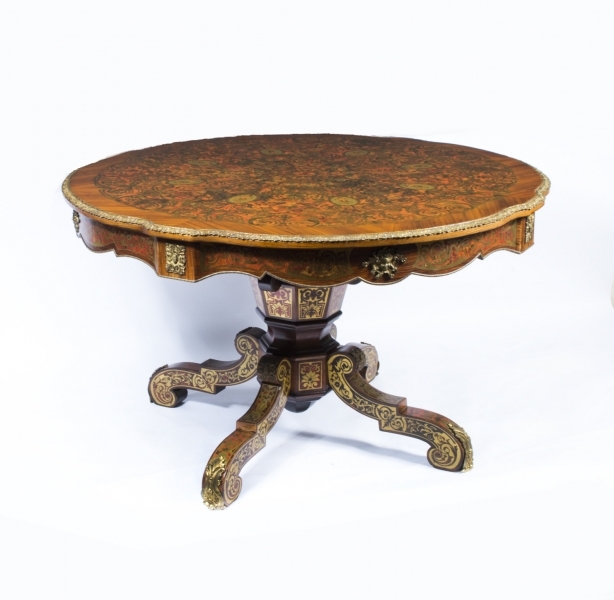 This fine table featured a circular shaped top with floral marquetry decoration, striking walnut crossbanding set off with an ormolu border. The frieze is decorated with cherub masque ormolu mounts and cut brass inlay work. 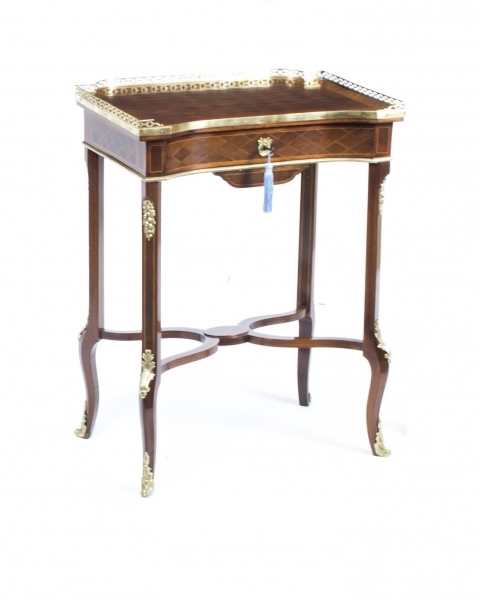 There is a very attractive four legged base providing stable support, this having Red Boulle cut brass decoration and also featuring ormolu mounts. This table measures 78 high x 132 cm diameter (2 feet, 7 inches x 4 feet, 4 inches diameter). 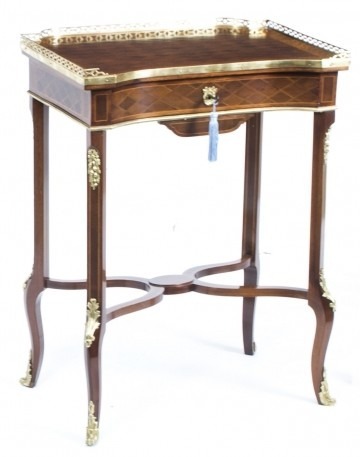 Fashioned by craftsmen from very fine rosewood and mahogany, this table has a decorative pierced brass three quarter gallery together with a frieze drawer for storage and a a smaller pull out work box underneath. 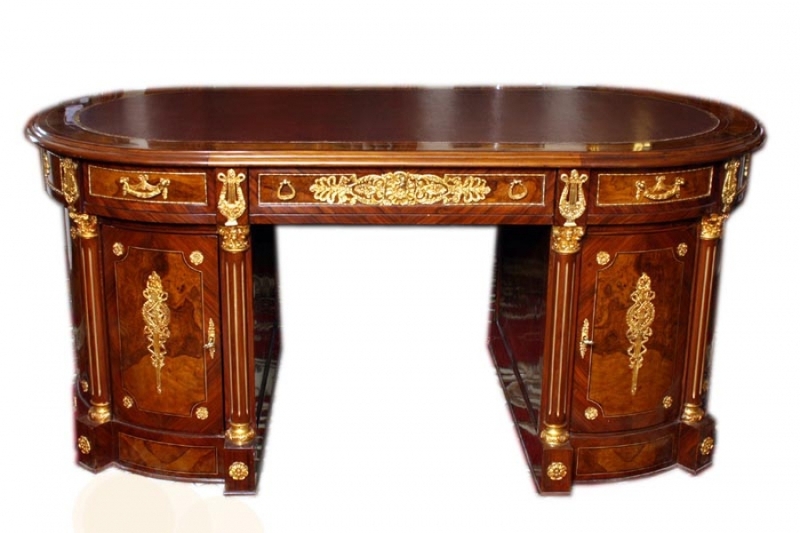 There are superb gilded ormolu mounts and the top and frieze feature beautiful parquetry decoration. The whole item is inlaid with boxwood lozenges. As you can see from the photogrpagh, the table stands on elegant cabriole legs with a shaped x-stretcher. It was supplied with a working lock and key – always the perfect finishing touch and one which is always much appreciated. 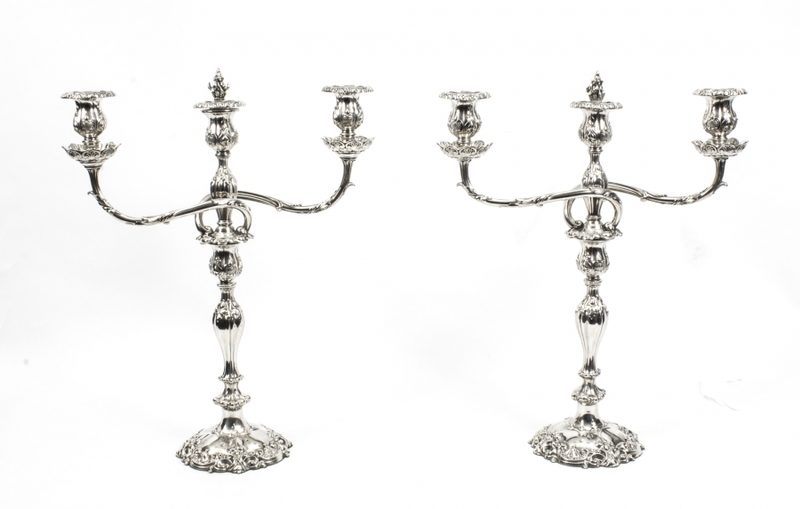 One of the standout items was this Antique Pair Old Sheffield Candelabra by Cresswick which we have dated to around 1820. 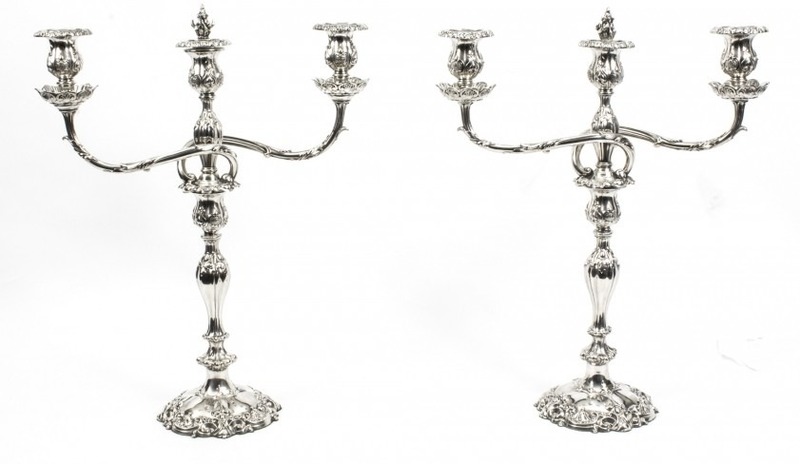 We were very proud to have been able to find an appreciative home for this pair of Old Sheffield George III silver plated two branch three light table candelabra which bears makers mark for the renowned Sheffield silversmith Cresswick and dated to around 1820. The candelabra stand some 50cm in height and feature detachable sconces. We were pleased to have been able to supply them in excellent condition, with clear makers marks. There were no dings, dents or any sign of repair having been carried out. This is just a small selection of the items we have recently sold but, don’t worry, we are constantly replenishing our stock and there are some lovely new pieces becoming available soon. Please visit our newly listed section for more information.